This post is for you performance junkies out there. Some of us love going fast. 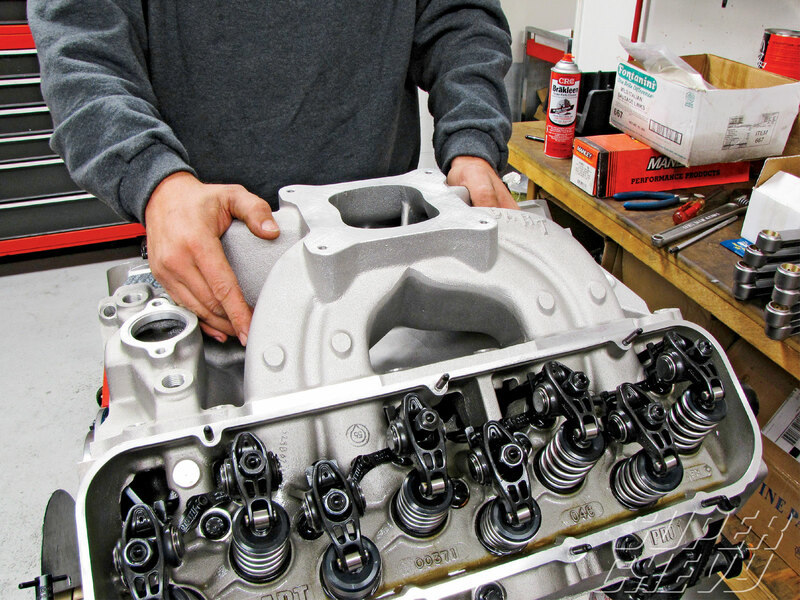 One of the best ways to add more horsepower to your car is by adding a performance intake manifold. Installing an intake manifold is very simple as far as the level of complication involved in general mechanics. However there are some “Do’s and Don’ts” that every professional auto tech follows. The first step of any car repair is to gather the needed tools. For this repair, you will need a new air intake manifold, a new air intake gasket, a socket set, a torque wrench, a fluid collection pan, engine coolant, and a screwdriver set. Drain the engine coolant by locating the plug on the underside of the radiator reservoir. Place the collection pan underneath this plug and then remove the plug. This will allow the fluid to drain out. You will need a large collection pan to hold all of the engine coolant. Now you are ready to start removal of the manifold. The manifold will be connected by a variety of sensors and wires. If it is held in place by a screw, it is most likely a sensor. Take note of where they are connected, and then unscrew all of the sensors. After you have removed the sensors, you are ready to disconnect the air lines. The number of lines will vary by the make and model of your vehicle. 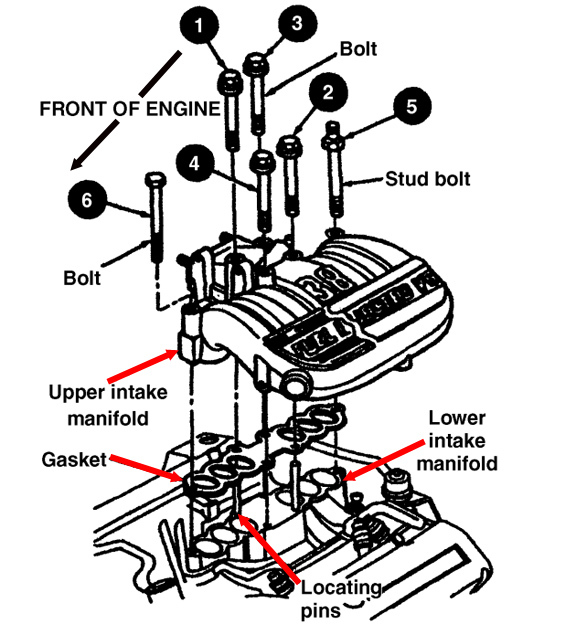 You want to remove each of the air lines from the manifold. These will generally look like small rubber tubes. 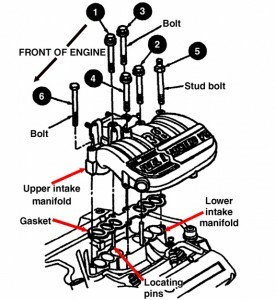 The manifold should be disconnected from all connections at this point, but it will still be held in place by a series of bolts. You want to locate these and then remove them. You will likely need to use your torque wrench to loosen them. Now you are ready to remove the air intake manifold. It should lift easily out of the mount. If there is any rust, you may need to use gentle force to pry it off. Do not use a lot of force as there are many delicate engine components in this area you could damage. Now that the manifold has been removed, you should see the manifold gasket where it attached to the engine. You want to remove this completely. Sometimes the gasket will tear and leave a piece attached. If this is the case, gently scrape it off. Install the new gasket. This will form the seal between the air intake manifold and the engine. Make sure that the gasket is laid flat against the engine. Now you can install the new manifold. Make sure that it lines up with the new gasket when you are placing it in the mount. Re-install the bolts to hold it in place. After the bolts have been installed, you will also need to replace the air lines. These should slide on easily. Finally, you will need to re-install all of the sensors. Install them in their original positions and tighten the screws to hold them in place. The last step is to refill the engine coolant. Make sure that you have replaced the plug before you add coolant. Then, simply fill the reservoir until the coolant level reaches the fill line. This entry was posted in General by MACK HANSON. Bookmark the permalink.